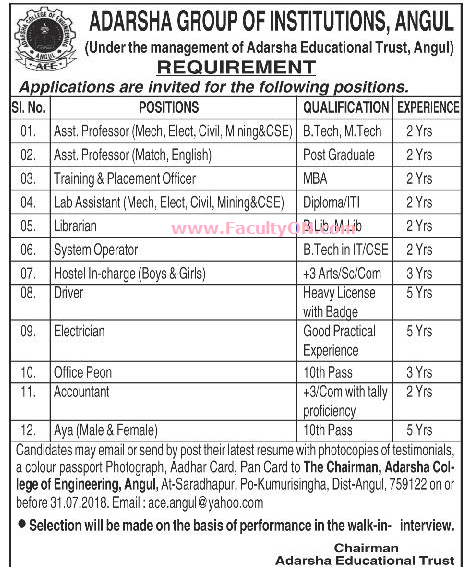 Adarsha Group of Institutions, Angul has advertised in the SAMAJA newspaper for the recruitment of Teaching Faculty- Assistant Professor Plus Non-Faculty jobs vacancies. Interested and eligible job aspirants are requested to apply on or before 31st July 2018 . Check out further more details below. College Profile: ACE was established in the year 2009 to promote quality education in engineering & technology. ACE is approved by all India Council for Technical Education (AICTE) under Ministry of HRD, Govt. of India, recognized by Govt. of Odisha and affiliated to BPUT, Odisha, to offer 4 year programs leading to Degree Engineering. Keeping in view the emerging economic needs and opportunities for jobs in the industrial capital of Odisha. ACE offers B.Tech Courses in mining-engineering Engineering, mechanical-engineeringanical Engineering, Civil Engineering, Electrical Engineering, Electrical & Electronics Engineering, Electronics & Communicative Engineering and Computer Science & Engineering. ACE is located in Angul City, which is also known as “Industrial City” of India and is well connected with rail & road.